After an awkward introduction to his live Q&A at Facebook's Palo Alto, Calif., headquarters, former President George W. Bush told CEO Mark Zuckerberg "you're not exactly Jay Leno." 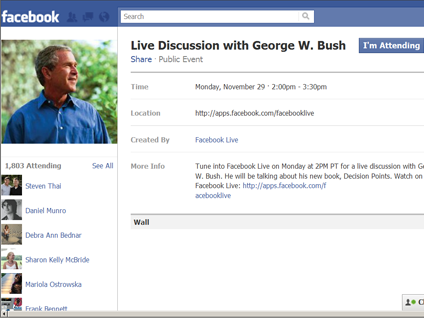 Mr. Bush was in a relaxed, jocular mood with the mostly liberal and young Facebook staff. Mr. Bush joked, "People didn't think I could read and write." He continued his comedy act, stating that his goal in coming to Facebook was to "shamelessly" market his book, "Decision Points." Asked specifically by Zuckerberg why he chose to visit the Facebook hive, Mr. Bush said, "You've got a lot people paying attention to us, and I'm trying to sell books." Mr. Bush noted that he has more than 600,000 Facebook "friends," and complimented Zuckerberg and company on their entrepreneurship. The discussion turned to technology, but Mr. Bush wasn't playing much to the crowd. He explained that he didn't use much technology during his presidency, due to the Freedom of Information Act. His presidency amassed 170 million emails, which would potentially become part of the public record. "I didn't want any of them to be mine," he stated. In his post-presidential life he is a Blackberry and iPad user, and he said he uses "the Facebook." After moderator Facebook General Counsel Ted Ullyot asked about the former president's iPod usage while riding his bike, Mr. Bush said, "I don't use the iPod anymore -- I like to hear the birds." He told the crowd that he has "had enough of fame." "I want to focus on some productive areas after 14 years of living in the lights," Mr. Bush added. "I've written this book because I've recognized there's no such thing as an accurate short-term history. I want to give future historians a perspective: mine," he said. Asked about defending his record and criticizing President Obama, Mr. Bush said, "I'm happy with what I'm doing. I didn't like it when former presidents criticized me." He went on to discuss living in the harsh light of the presidency. "There is a lot of criticism, but it's always been that way. I read a lot about Abraham Lincoln when I was president. He was treated harshly....I watched my dad get criticized harshly....by the time I became president, it was nothing compared to watching him get criticized. It comes with the territory," Mr. Bush said. "If you believe in what you are doing the criticisms mean nothing in the end," he added. On the subject of the recent WikiLeaks documents release, Mr. Bush said, "Leaks are very damaging and people who leak ought to be prosecuted." He gauged that "it will be hard in some cases to keep the trust of foreign leaders." "A culture of loyalty to not you but the greater cause is important to be successful," he said. "It's disloyal in this case to the country to put out secrets." Mr. Bush was asked about leadership qualities. "I do believe in creative tension. A key for leaders is to understand when creative tension gets out of hand," he said. "It's important for leaders to give people access without totally stressing out your day. In the White House people needed to be able to say, 'I told the old boy this' as part of building a culture of mutual participation." The subject of education was brought up, including Mr. Bush's ongoing interest in improving schools and Zuckerberg's donation to the Newark school district. "You didn't even graduate from college," he quipped. Zuckerberg famously dropped out of Harvard to build Facebook. "Facebook works because you measure...public schools need to do the same," Mr. Bush said. "Accountability allows you to diagnose and prescribe," he added. On his thinking process around the bank bailout during the financial meltdown near the end of his presidency, Mr. Bush described his decision as a threshold question -- "depression or no depression." "I can't prove to you that it prevented a depression, but I can tell you we didn't have one," he said. The 26-year-old Zuckerberg chimed in that it often seems that Facebook doesn't have easy choices if you are moving forward. "A lot of the things we build are a lot clearer internally than externally," he said. He told Mr. Bush that he always admired his sticking to his decisions, whether people agree or disagree, amidst criticism. Mr. Bush was asked if he believed that Iraq can be a stable democracy? "I think people want to be free," he said. "A democracy in the heart of the Middle East will be transformative. ...It will work, we just have to hang in there." Mr. Bush also had comments about rocker and humanitarian Bono: "He's a really good guy, so go to his rock concerts...buy my book." The former president was asked what he would like his legacy to be. "As the guy who protected the country and didn't sell his soul for the sake politics," he answered. After living a complex existence, Mr. Bush said the "simple things begin to matter more," and he appreciated being with his mother and father in their twilight years. "This book is my way of letting you in on my life as president," he said. "I'm not trying to shape any post-presidency. If you see me in airport, I hope you wave with all five fingers. If you don't you won't be the first. I'm a comfortable guy...you have to live life to the fullest."